Hi All, Just saw this when I signed onto AOL and this was a headline. 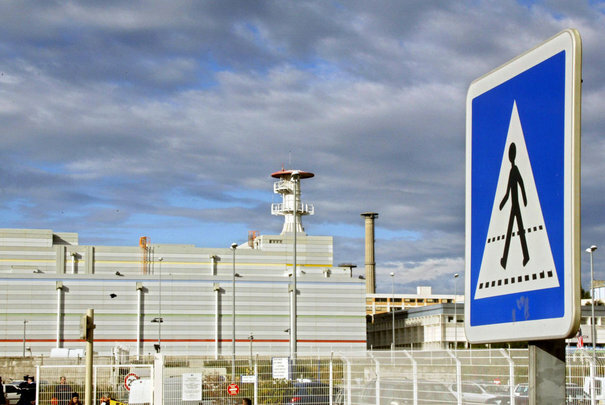 PARIS (AP) -- The French nuclear safety body says one person died and another was seriously injured Monday in an explosion at the Marcoule nuclear site in southern France. The Nuclear Safety Authority said there have been no radiation leaks outside of the plant, which treats nuclear waste with little radioactivity. Three other people were injured in the explosion, the statement said. Staff at the plant reacted to the accident according to planned procedures, it said. The Marcoule site is located in Langedoc Roussillon, in southern France, near the Mediterranean Sea. Suzanne notes: Sometimes the comments after a news alert or article give you better inside information pretty quick. The links right after this comment give access to more aspects of concern about the safety of European nuke plants. Marcoule nuclear plant generates power by recycling decommissi­oned nuclear weapons. Marcoule is operated by SOCODEI, a waste solutions susidiary of Electricit­e de France and is the largest untility company in the world producing 22% of the electricit­y for the European Union and 75% of which comes from nuclear power. On the 9th of September, there was an earthquake with a magnitude of 4.3 near a nuclear plant on the border of the Netherland­s and Germany. Sorry, I can't seem to make those links directly functional. You can copy and paste them into your browser. Is it to become commonplace for these plants to pop all over the map? Seems a little like the shelf life of GE's creations are bringing something else to life. I've read that the France pop was a transformer and nothing to be concerned with. Well, any explosion at any of these plants causes ALL people to cringe so how 'good' could it really be? Remove the cause of the anxiety, correct? This is not a nuclear plant but it is worrying. "The explosion did not cause any radioactive or chemical leakage outside the facility, said the Nuclear Safety Authority"
WELL, HOW MANY LIES HAVE WE HEARD BEFORE ABOUT OTHER INCIDENTS? Low Level waste is bandied about in the media as if it is somehow safe. The link below properly debunks this false notion presented by the media. "Low-Level" Radioactive Waste is one of the most misleading terms ever created. In the U.S., it is all nuclear waste that is not legally high-level waste, some transuranic waste, or mill tailings. High-Level Radioactive Waste is: the irradiated fuel from the cores of nuclear reactors, the liquid and sludge wastes that are left over after irradiated fuel has been reprocessed (a procedure used to extract uranium and plutonium), the solid that would result from efforts to solidify that liquid and sludge from reprocessing. Transuranic Waste is material contaminated with radioactive elements heavier than uranium, such as plutonium, neptunium, americium and curium. These elements: have extremely long hazardous lives--hundreds of thousands to millions of years and emit alpha radiation a type of radiation that is especially dangerous if inhaled or swallowed. Some transuranic waste is allowed in the "low-level" radioactive waste category. In 1983, when the Nuclear Regulatory Commission (NRC) adopted regulations on land disposal of radioactive waste (lOCFR61), it increased the allowable concentration of transuranics in "low-level" radioactive waste. Uranium Mill tailings, resulting from mining and milling uranium for weapons and commercial reactors, are not usually included in the "low-level" waste category, but may be handled with it in some states. The large volumes of these wastes, which will emit radiation for centuries, pose serious health problems. WHAT IS "LOW-LEVEL" RADIOACTIVE WASTE? Irradiated Components and Piping: reactor hardware and pipes that are in continual contact with highly radioactive water for the 20 to 30 years the reactor operates. The metal becomes "activated" or radioactive itself from bombardment by neutrons that are released when energy is produced. Also called Irradiated Primary System Components. Control Rods: from the core of nuclear power plants--rods that regulate and stop the nuclear reactions in the reactor core. Poison Curtains: which absorb neutrons from the water in the reactor core and irradiated fuel (high level waste) pool. Resins, Sludges, Filters and Evaporator Bottoms: from cleansing the water that circulates around the irradiated fuel in the reactor vessel and in the fuel pool, which holds the irradiated fuel when it is removed from the core. Entire Nuclear Power Plants if and when they are dismantled. This includes, for example, from a typical 1,000 megawatt nuclear reactor building floor: over 13,000 tons of contaminated concrete and over 1,400 tons of contaminated reinforcing steel bar. The highly radioactive and long-lived reactor wastes are included in the "low-level" waste category along with the much less concentrated and generally much shorter-lived wastes from medical treatment and diagnosis and some types of scientific research. P.S. Well, I still do not know why I can't make the direct live links work! As for the question of believing media reports about this, I think I am at the point now where I see the multitudes of mishaps and wonder why they are so close together. My more 'crazy' side also wonders about the path of lightning through the tree of life and am inclined to survey the troubled reactors to find a potential mapping of the events. Who knows...that's a heavy stretch. I guess it's a matter of energy seeking to complete itself... much like what I see from Gregory's posts and the color anti-color descriptions. So if black happens, then white would surely follow. The journalist said to him: "In France, nuclear safety is a problem"
An explosion occurred around 12:37 in a treatment facility for radioactive waste. It is located in the town of Codolet (Gard) near the nuclear center at Marcoule, which explains the initial confusion locating the accident at the center. The installation is the Centraco, a subsidiary of EDF. The fire was extinguished by firefighters at 1:06 p.m. from EDF information. It takes care of waste recycling FA and TFA - low and very low activity, so the packaging, gloves, personal protective equipment, etc..
in another article : "The oven "used to melt metal radioactive waste of low and very low activity."" Last edited by fox on Mon Sep 12, 2011 7:36 pm, edited 1 time in total. "It was mentioned that, according to sources of Mail on Sunday, Societe Generale, one of the largest banks in Europe, was in a state of 'dangerous', potentially' the brink of disaster", said the tabloid on its website. Impossible, Gregory ! and you know why? I guess if there is another "accident" they may accelerate this phase out of nuclear power in Switzerland and around the globe. The first of 5 plants is planned to get shut-down 2019.